The Little ones club continues to offers members lots of benefits; free access to hundreds of nutritionally approved recipes, including time-saving family meals, five-day meal planners and parenting tips. Sainsbury’s Little ones baby & toddler club is growing up and getting even better with a relaunched site that provides an improved user experience and greater opportunities for advertising and revenue. 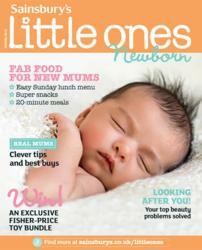 Launched in October 2009, Sainsbury’s Little ones baby & toddler club comprises fantastic lifestage-targeted glossy magazines and monthly content-rich emails. The heart of the club, however, is the website (sainsburys.co.uk/littleones), launched by Seven. With a growing member base of half a million, Seven has reviewed and refined the Sainsbury’s customer journey to make strategic use of the Sainsbury’s Little ones online channels, improving customer engagement and loyalty towards the brand by presenting recipes and editorial content in an easy-to-navigate format. To tie in with the new Little ones customer journey, the new site structure splits content by five key lifestages, including pregnancy, newborn, weaning, toddler and pre-school, making the content more relevant and targeted for users. A fantastic new Mum zone area on the site has also been introduced. Users can send in their own tips, stories and Sainsbury’s product recommendations, which are shared across the club’s communication channels. One of the key elements of the club is the easy access to hundreds of nutritionally approved recipes. Seven has built an easy-to-use advanced recipe search, to ensure parents can find delicious family meals fast. The recipes on the Little ones website generate significant sales through online shopping. A survey of members who shopped on sainsburys.co.uk via Little ones revealed that 83% bought additional items and 55% would shop online through Little ones again. In tandem, Seven has rolled out a new, segmented monthly Little ones email campaign, which allows the club to target content to the exact stage of pregnancy or child development of its members, including lifestage-relevant advice, offers, nutritionally approved recipes and parenting tips, as well as content from real mums. Broadcast for the first time this month, the fully dynamic, highly targeted build allows further opportunities for targeted advertising, too. Packed with more than 350 recipes, meal planners, exclusive offers and advice, the Little ones site is a measurable success. Since launch it’s had more than 2.8 million visits, over 12.6 million pages have been viewed, and the conversion rate for new visitors joining averages 41% a month. Members are also returning to the site more than ever, too – the key driver being its approachable editorial style. Open and click-through rates remain impressive at 25-40%, and engagement from tailored emails is considerably higher than non-targeted campaigns.